The classic Rodgers and Hammerstein song “We Kiss in a Shadow” holds new meaning when sung by a male couple. A new YouTube series — “R&H Goes Pop!” — is reimagining Rodgers and Hammerstein classics for the 21st century. 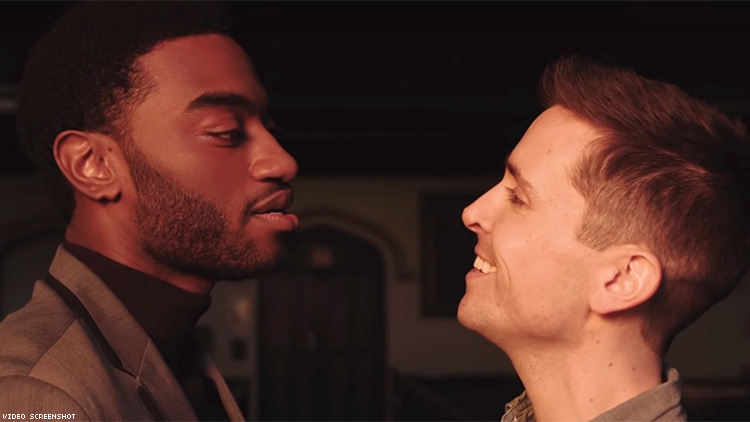 And the latest entry is a gay love story set to “We Kiss in a Shadow” from the early ’50s musical The King and I. Frozen’s Jelani Alladin and Matt Doyle (The Book of Mormon, Spring Awakening) perform a moving rendition of the song that was originally sung by forbidden lovers Tuptim (an enslaved young woman sent from Burma as a gift to the king of Siam) and her true love, Lun Tha. "One of the reasons I was so excited about doing this song, in this context, is how universal these words are," gay Broadway star Doyle said, according to Broadway World. "Anyone who has felt like they weren't able to express who they are or how they love can listen to this song and find a connection." "Unfortunately, we are living in a world, in a space, that doesn't value love of all kinds," Alladin said. "This song is our way of understanding how we can begin to accept love of all kinds, to embrace the ugliness, the beautifulness of all of it and understand that we are all human." “R&H Goes Pop!” launched in conjunction with the 75th anniversary of Oklahoma, Richard Rodgers and Oscar Hammerstein’s first collaboration. Watch the video for “We Kiss in a Shadow” below.